Where can we live if not in each other's shadow? World-renowned artist Shaun Tan applies his unique imagination to a reflection on the nature of humans and animals, and our urban coexistence. From crocodile to frog, tiger to bee, this is a dark and surreal exploration of the pere... read full description below. 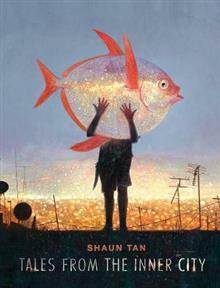 Shaun Tan grew up in Perth, Western Australia, and currently works as an artist, writer and film-maker in Melbourne. He began creating images for science fiction stories in small-press magazines as a teenager, and has since become best known for illustrated books that deal with social, political and historical subjects through dream-like imagery. The Rabbits, The Red Tree, The Lost Thing, Tales from Outer Suburbia, The Arrival, Rules of Summer and The Singing Bones have been enjoyed by readers of all ages, locally and internationally. Shaun has also worked as a theatre designer, a concept artist for Pixar and Blue Sky Studios, and won an Academy Award for the short film adaptation of The Lost Thing. In 2011 he received the prestigious Astrid Lindgren Memorial Award in Sweden, in recognition of his services to literature for young people.